I can't stop eating these cookies! The flavors are intense but oh so good. They don't have a lot of flour and the recipe calls for melted and cooled butter so chilling the full two hours is a must. The cookies spread quite a bit so do not try to crowd them on the cookie sheet. The final cookie is quite thin but still chewy. I substituted 1/8 teas. ground white pepper for the cracked white peppercorns. Perfect cobbler! Nothing unusual about it but it's a hit. We've made it several times now. This preserve is amazing!! Such a brilliant melding of flavors, and pretty easy to boot. I used about 3/4 the sugar called for since the kumquat peels I was working with were sweeter than usual and I ended up using this between layers in a birthday/housewarming cake. It definitely didn't "gel" quite as much and I wouldn't store it out of the fridge for long this way, but the texture was still fine and I think it allowed the tartness of the kumquats to come through a bit more. Malika Ameen is a genius and I'm honestly thinking about starting a food blog JUST so I can give this apparently overlooked book the love it deserves. Yummy but not quite sure when/where to serve it. More like a danish than a savory bread. We mostly enjoyed it cold for breakfast as leftovers. I'm not saying this recipe is brilliant and inspired and utter February perfection, but I AM saying it won the work bake-off in a landslide, against some thirty-odd very skilled competitors. I'd really like to keep this title and continue to be lauded as a pastry/flavor genius so...no one should ever make this. Move along. 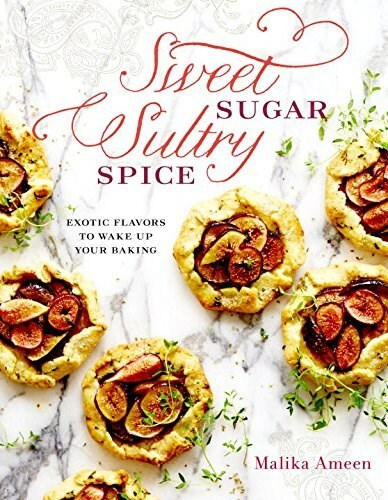 A diverse and accessible collection of spice-enhanced recipes that will transform your baking and awaken your senses--from a classically trained pastry chef. Welcome to a world of exotic spices and flavorings from the warm embrace of clove and ginger to the fiery touch of peppercorns and chiles, from the sensual kiss of cardamom and rose to the surprising sensations of sumac and za'atar. With encouraging language, invaluable tips, and a passionate approach to flavor, Malika Ameen seeks to push spices beyond the realm of savory to the world of sweet where they can add everything from a delicate whisper to a surprising punch to cakes and tarts, cookies and bars, ice creams and sorbets, barks and brittles, and more. The 78 recipes are arranged by the feelings and sensations they evoke: Spicy and Warm; Floral and Aromatic; Bright and Fresh; Savory, Earthy and Nutty; and Complex and Mysterious. Create showstoppers such as Roasted Peach and Custard Borek for your next culinary gathering; its velvety saffron cream and subtle cardamom sugar are all wrapped inside light, crunchy layers of phyllo dough. Update classics with a new twist such as Lusty Lemon Squares with a spiced dark chocolate crust dotted with pink peppercorns. Kids and the young at heart will delight in the orange zest, vanilla bean, and cinnamon spiced churros with their accompanying sticky toffee sauce. Beautiful full-page images and an invaluable spice glossary help round out an accessible addition to any dessert library.